Posted September 21, 2015 . 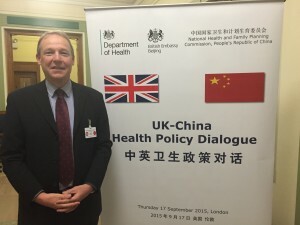 An increased working collaboration between the UK and China was reinforced today at the UK-China Health Policy Dialogue, by Vice Premier Liu Yandong and Minister for Health Jeremy Hunt. Areas of increased co-operation included multi-level health systems support, new antimicrobial development and health infrastructure support in Africa. There was also a focus on antimicrobial resistance. Ms Liu Yandong outlined the challenges facing China – it needs 1 million more doctors and 2 million more nurses and limited primary care among many others. The close working between the UK and China in Sierra Leone during the Ebola outbreak was highlighted by both countries and by Dr Margaret Chan, Director General of the WHO. This was the first time China had sent personnel abroad for a major humanitarian health crisis. Following this session, a round table on additional health needs was chaired by Dame Sally Davies, Chief Medical Officer in the UK. The challenges of antimicrobial resistance were highlighted by Lord Jim O’Neill from the UK Treasury. GAFFI’s President made a plea to address antifungal resistance and to improve fungal diagnostic capability in China, probably with reference laboratories in each province.